Just worked the evening shift with a guy who grew up in the same backwater town as I did, and I suddenly (and very distinctly) remember borrowing The Legend of Zelda (NES, 1987) from him, back in the day. For those who don’t know, this game was one of the first games that featured an internal battery to facilitate data saving – which, it turns out, was the reason I had to go into hiding for a couple of years… By mistake I deleted his progress, his character, and all his effort put into this classic game. He had the blue ring and the white sword, I remember that much. The blue ring cuts received damage in half and turns Link’s outfit, well, blue. The white sword is more powerful than the wooden sword, but less powerful than the magic sword. Having acquired these items seemed like a big deal to me, so I just left the game at his house without saying anything and avoided him for the next couple of years. That was almost 20 years ago. Now we have once again crossed paths. He doesn’t seem to remember it, though. Maybe he moved on. Anyway, I’m sorry Daniel. Really. This post is nowhere near as academic or investigating as the title might suggest. Expectations lowered? Alright. I’d like to play a failed, unemployed guy in his mid-forties. Perhaps a heavyset man who tires quickly? In short, I want weaknesses and flaws – not muscle, beauty and competence. As I’ve understood it, Eternal Darkness (2003) lets you control an array of characters with no apparent skills nor good looks. I like that. It gives the characters a certain depth, unlike those soulless, muscle-flexing idiots you usually get to manoeuvre. Always so tough and able. I’m sick of it. Just give me a paraplegic in a wheelchair, or someone with racial issues and a drinking problem – a real bigot, a mediocre backpeddler. I’d like to take that journey, please. On a more positive note, and as an example, the protagonist in upcoming Alan Wake features an author, who’s suffering from insomnia and writers block. Taking refuge in a backwater town, the monsters of his nightmares soon arrive to plague him. Which is believable and realistic in some aspects (not the monster part, right?). That title is perhaps where my hopes lie in 2008. Let’s hope it doesn’t slip into the fiery depths of 2009. The new Alone In the Dark will also feature one certain Edward Carnby, who’s supposedly not too handy with a gun. Ooh, I’m gonna enjoy dying over and over again! Also, Fahrenheit (Indigo Prophecy) tried a different route, and there’s always trusty old Gordon Freeman, the silent protagonist. I think things were better back when the avatars didn’t talk so much, as there was less attitude to put up with. Can you guys name a few other characters that felt inspirational and interesting instead of tired and shallow? 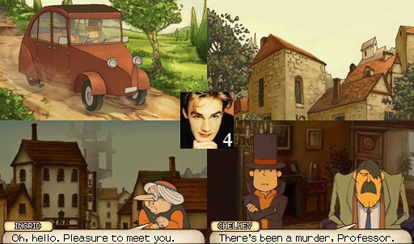 Everyone should head over to the Professor Layton website and try the game demo, which also includes some of the fine animated scenes from the game. Then, if you haven’t already, read my review of the game, further down on this page. Enjoy! Chances are I would sell my body to get my hands on this game. That’s how bad I want to try it. Anyway, after gushing about Civ Rev (which also shares the curved world phenomenon, if you compare the screens), I thought I’d mention some other titles that are on my list for 2008, and Spore is certainly one of them. This game, if you somehow managed to avoid reading about it, lets you create a species and guide it from the origin of life through various stages of civilization and technology, all the way into the far reaches of outer space. To be more precise, your creation will start off in the Tidal Pool Phase as a tiny single celled organism and then progress as you continue to evolve, eventually crawling onto land. The last segment of the game is called the Space Phase, where you traverse the galaxy in flying saucers, visiting (attacking) other civilizations, exploring the solar system, perhaps with the intent to colonize and terraform, all in the name of galactic dominance. Spore is due out this September. If you haven’t already, I urge you to take a look at the Eno/Wright seminar for more insight to the mechanics of the game, such as evolution and generative music. It’s also coming to the DS, but it will be watered down and sucky. Oh, and all my pictures have floating captions, in case you’ve missed it. I’m hoping that Sid Meier will deliver the goods come June, when Civilization Revolution drops. There has been lots of previews lately, and most importantly, a screenshot from the DS version. Now, as I’ve explained before, I’m a reformed PC strategy nerd. These days however, I want to play expansionist games in airports, in bed, or even in my bathroom. I also have the need of holding a cup of coffee in one hand, so there better not be any buttons to press whilst managing my troops. Granted, the DS version looks like Civ II or some mobile phone version, but that doesn’t matter. Age of Empires proved that the DS is a well suited platform for strategy gaming. Full circle. Anyone else with high hopes? Feel like playing Asteroids and Gauntlet at the same time? Or perhaps Zelda mashed up with Super Mario? Well, today is your lucky day. ROM Check Fail! is a competent (and demented) arcade mash-up and retrospective at the same time, forcing you to play at least two classics at the time, merged together and unified in awesome ways. Confusing for sure, but I’m pretty sure your nerdy brain will be able to handle it.